If you bill your clients regularly, for ongoing expenses or on a retainer agreement, then recurring invoices are a huge time saver. Recurring invoices allow you to create an invoice template for a client, and have it generate invoices according to a schedule. On this page your can view all of your recurring invoices, and create a new one. Click the Create a Recurring Invoice button. Choose the client that the invoice is for, and the schedule for the invoice. You can create an invoice by week, month or year, and at any interval. Eg. "Every 3 weeks on Tuesdays", "Every month on the 3rd day of the month", or "Every year on February 1st". A preview of the schedule you've set is shown. You'll be able to adjust the schedule later. When you're done, click Compose Invoice to head to the invoice composer. Compose your invoice as usual. You don't need to fill out the invoice number or dates because those are generated automatically. When the invoice's next scheduled date comes around an invoice will be generated automatically, and you will receive an email to let you know. You'll be able to preview, add to or modify the invoice before sending it. The generated invoice is not sent to your client automatically. 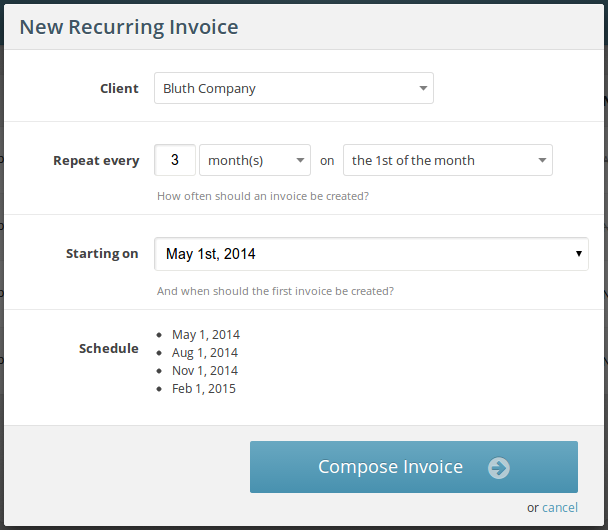 If you don't want invoices to be generated you can temporarily disable a recurring invoice and enable it again later. A recurring invoice's schedule can be changed at any time. You can manually generate an invoice from a recurring invoice at any time. 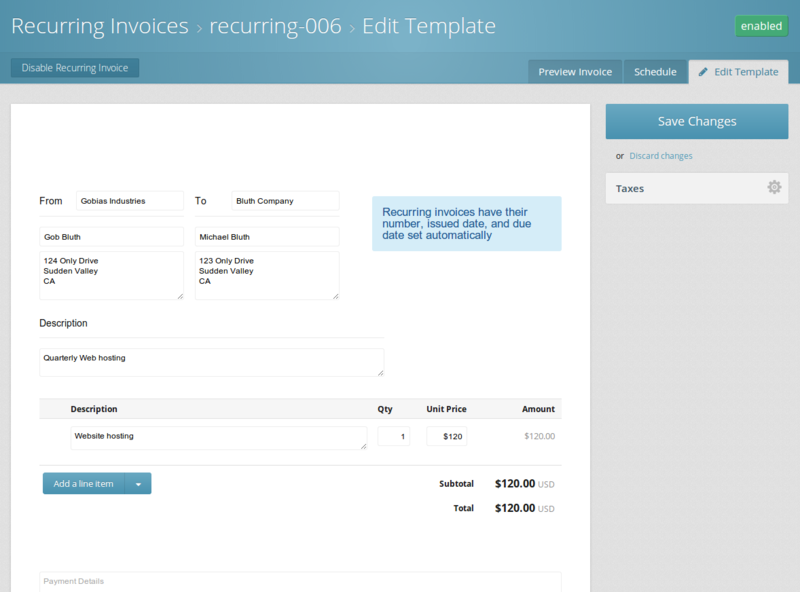 Go to the recurring invoice's preview page where you'll find a huge button toGenerate an invoice now. This is especially useful if you don't want to wait for the first invoice to be generated automatically. If a recurring invoice generates an invoice that you don't want, just delete the drafted invoice. Recurring invoices can't automatically create line items from your billable time, but that's coming soon!